Learning to follow a healthy diet doesn’t come naturally, not even after committing to a medical weight loss program in Ocala. While your weight loss doctor can provide you with essential tools, guidance and tips to help you develop a healthier way of life as you lose weight, you will need to develop additional strategies keep up with your weight loss goals—and to maintain the weight you lose as time goes on. Some healthy habits are harder to develop than others. When it comes to eating healthier you might be surprised to realize how beneficial just a small change in behavior can be. 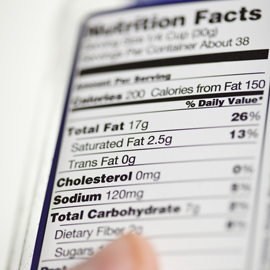 Reading nutrition labels will increase your awareness about the foods you eat. Once you have the information needed to make healthy decisions, it is up to you to keep up with your medical weight loss efforts by eating foods in the best interest of your health. Nutrition labels are the black and white grids located on the side panel of every box, bag or bottle of food or drink you come across. These cheat sheets are strategically placed to help you make a smart decision about what to eat, yet many people ignore their presence and go on munching in happy ignorance. Start at the top: The very top of the nutrition label has crucial information for your medical weight loss diet, including the serving size and calorie count. Never assume that one package of food is one serving—this can lead to the consumption of several hundred extra calories. Check the nutrients: The middle of the nutrition label holds pertinent information about the nutrients the product holds—the good and the bad. Try to consume as little of fat, sugar, sodium and cholesterol as possible while looking for higher levels of fiber, protein, vitamins A and C, iron and calcium. Understand percentage points: The right side of the nutrition panel provides percentages of daily values. This tells you how much of your daily recommended value of each nutrient one serving of this product contains. The higher the percentage point, the more of your daily value is accounted for in one serving. Make a habit of looking at the nutrition label of every item you eat or drink. You might find that simply knowing more about what is in each product helps you make healthier choices, which will ultimately lead to a healthier diet.